How much would you get for this fridge? Depends on the state. Call it the “Cash for Kitchen (and laundry room) Clunkers” program. If you have an old energy-guzzling refrigerator, air conditioner or washing machine you’d love to replace, it may be a good idea to wait until November when a cash-for-clunkers type program for home appliances begins to roll out across the country. The rebate program, part of the government's $787 billion economic stimulus package, provides $300 million in federal funds to encourage consumers to buy energy-efficient appliances. But it is unclear how much the appliance program will save in terms of energy consumption — and whether these appliances will be recycled or just end up in a landfill. 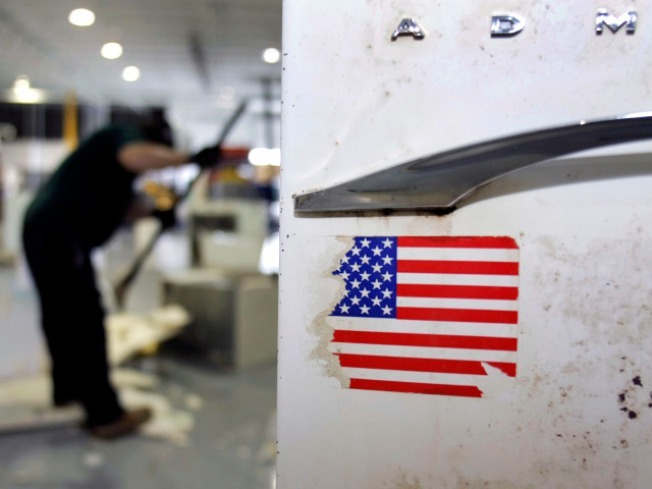 And unlike the hugely successful $3 billion “Cash for Clunkers” vehicle trade-in program, the appliance rebates will be handed out under a hodgepodge of plans implemented by individual states, with the money divvied up according to each state's population. Consumers will be eligible for a rebate only if they buy products that meet federal Energy Star qualifications for appliance efficiency. Rebates under the program could range from $50 to $250, depending on the type of appliance. States have until mid-October to come up with their own plans for how the rebate programs will work, what appliances will be included, how much will be paid out and even how to dispose of the "clunkers." While there is no recycling requirement, the Department of Energy “is encouraging states and territories to include appliance-recycling programs along with the rebate programs to help remove inefficient products from the electric grid,” said Jen Stutsman, a spokeswoman for the department. The Obama administration sees the program as a way to boost the economy and the environment at the same time. That is, of course, if you get rid of that old, energy-consuming refrigerator and not just move it to the basement and store beer in it. What to do with old appliances? It’s unclear whether consumers will step up to the plate and find ways to recycle big appliances. Many probably hope the process will be handled by the retailer from which they buy their new appliance. Andrea Lechner-Becker, a marketing manager for an art studio who moved into a new condo in Phoenix last year, plans on buying a new washer and dryer to replace her old ones when the rebate program kicks into gear. Most retailers do offer to cart off old, large appliances for free, said Maureen Riehl, a spokeswoman for the National Retail Federation. But how recycling will be handled under the new program, which is likely to inundate the system with lots of old appliances, hasn’t been worked out yet. “What each state department of energy or corresponding environmental department will do is all in wait-and-see mode,” she said. That leaves it up to a patchwork of environmental laws that rarely mandate recycling of household appliances other than computers and televisions, said Scott Cassel, executive director of Product Stewardship Institute, a nonprofit that focuses on waste management issues related to consumer products. Many states are facing budget shortfalls, and Cassel said local governments could be stuck with the cost of disposing or recycling old appliances. Officials in New York state, which is receiving $18.7 million under the program, are studying whether to require a trade-in component or recycling, said Colleen Ryan, a spokeswoman for the New York Energy Research and Development Authority. California, which is getting $35 million of the funds, also has yet to commit. Retailers that operate nationally could face a daunting task of figuring out what’s offered in which states. But Doug Moore, president of appliances for Sears Holdings Corp., said the retailer is ready. “Whatever states end up doing, we will assist them and make that happen,” he said. The company, he added, will use an online database and offer consumers quick access to what’s available in their states through a ZIP code-based lookup. As far as disposal of old appliances, he said, Sears, which also operates Kmart stores, already partners with the EPA and offers a voluntary program, known as RAD, that removes ozone-depleting chemicals from appliances such as refrigerators and air conditioners. The company hauls away almost 75 percent of the old appliances, often for free, for the 6 million new appliances the retailer sells each year. While it’s unclear what impact the plan will have on the environment, industry experts hope it will be a boon for appliance makers, retailers, consumers and the economy. The retail federation’s Riehl predicted the rebate program could boost sales for some retailers by 30 percent. But she pointed out that retailers may end up spending some money on paperwork if the process is cumbersome. “A lot is going to be left in the details,” she added. Scott Testa, a professor of business administration at Cabrini College in Philadelphia, believes the program will attract the interest of shoppers. “It will stimulate manufacturing jobs and retail jobs, which have been hit hard,” he said. And Sears’ Moore isn’t worried that consumers will delay appliance purchases until the rebates kick in.